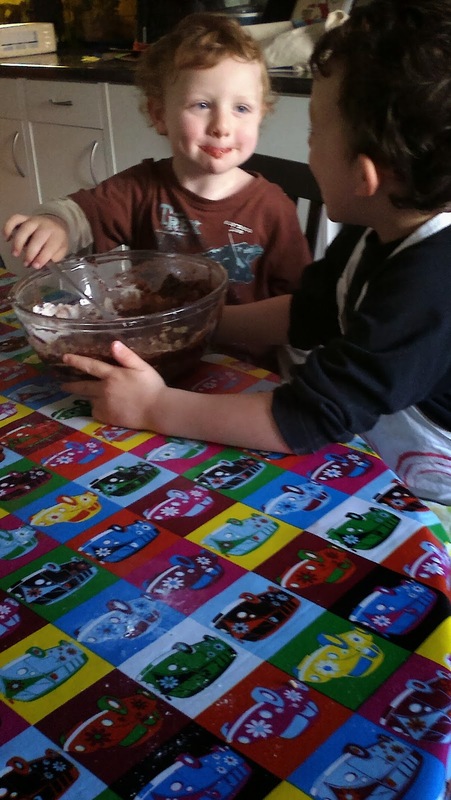 I love cooking with the kids, and it's such a brilliant thing to do with littlies because as well as being a lot of fun it gives them great self esteem from having spent time with an adult carer producing something that they can feel proud of. It is also helpful for developing numeracy skills in measuring, language and communication in talking about what you're doing, literacy if you're getting them to help follow a recipe, taking turns, the motor skills involved in transferring, cutting, stirring... The list of benefits is endless. I would normally add in that it also helps to foster a grounding in healthy eating, but this recipe is probably not going to fall into that category! There are healthier recipes out there for baking with your kids, but in developing this one all I'm really aiming for is reliability and being delicious. I've chosen to do the measurements in spoonfulls because now Toby can hear we are working on his counting. I've found the recipe works fine even if the spoonfulls are sometimes hugely mounded and other times almost level, so precision is not a big requirement of this recipe. I took out butter and substituted for oil largely because it makes it easier for kids to make, but it's also possibly a little better in the health stakes as real butter has more saturated fat. We avoid 'vegetable spread' though as I think that stuff is poison. This recipe is vegetarian but you need to use egg and milk substitutes if you're vegan. Quickest: leave out the baking powder, just make your mixture in a microwave safe bowl then microwave for around 5 minutes - zap for 4 minutes to test and then add more time if you think it needs it. I'm not the hugest fan of microwaves, but for immediate results if you want a sticky chocolate pudding to serve with ice cream this is a winner. Slower, but still simple: Add in 2 teaspoons of baking powder, divide the mixture between muffin cases (makes about 12) and bake for around 25 minutes at around 180 oC - if it smells cakey in your kitchen pull them out after 20mins and check by poking with a fork - if the fork comes out clean they're done, if not whack back in the oven for another 5 or 10 minutes. The timings are a bit vague here because it depends how much mix your kids managed to get into each case and besides I tend to cook by smell, the wall clock is largely just for decoration. Note about baking powder: it starts to produce carbon dioxide bubbles as soon as it gets into contact with the 'wet' ingredients, so if you're kids are really little and want to stir for a long time, add it in at the end of the mixing stage and give it a thorough stir in yourself to avoid flat cakes. Prettiest but even less healthy: Let your cupcakes cool and then ice them and add sprinkles. A basic frosting recipe is 140g softened butter (i.e. not straight from the fridge), 280 g icing sugar, up to 2 tbsp milk (to loosen the icing for piping if it's too stiff). 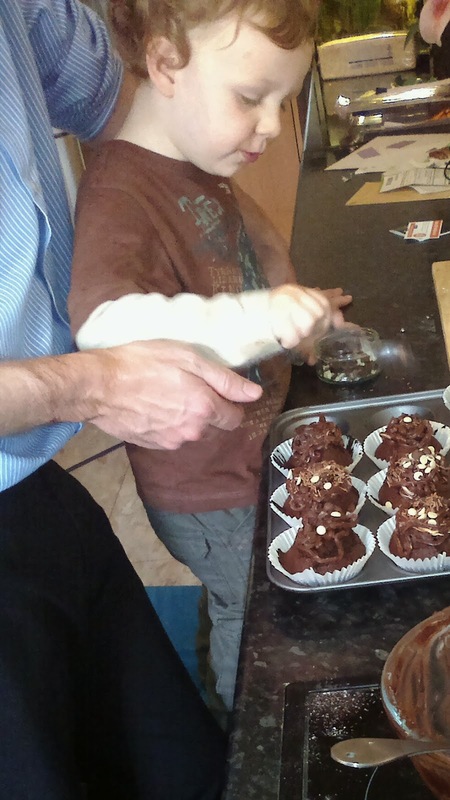 Matt did this part with the boys and they added cocoa powder to this too.